Paris Weekender - Wine? No, I’ll take a beer, please. Wine? No, I’ll take a beer, please. This summer, I discovered French beer. 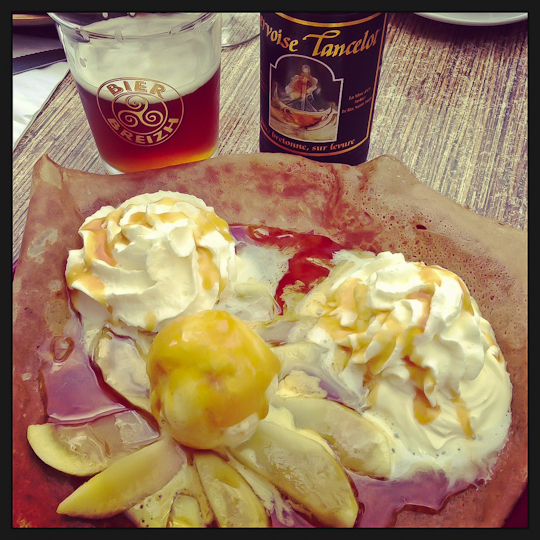 There’s no pairing like a Breton beer with an apple & salted butter caramel crêpe! France is known for its wine, not for its beer. But there is a growing number of microbreweries in France and some produce beer that can compete with the best. Brittany in particular has some fantastic beer, along with (not surprisingly) the region near the Belgium border and Alsace. Despite all the fine wine at my fingertips, I found myself more and more often ordering a beer. OK, actually what happened is that I was having a particularly healthy summer: hiking or biking all day, grilling up fresh fish and veggies for dinner, drinking very little. Then my aunt and uncle came to visit and they corrupted me. I didn’t take to the Breton whiskey*, which is apparently pas mal. I just don’t like any whiskey. But once I discovered Breton beer, I of course had to try as many different ones as possible. Some of the above came in blonde, blanche (wheat beer), ambrée, (amber) dorée (golden) and/or rousse (red). In other words, I had a few more than just seven beers. There was not a single one I didn’t like. Though in the end, the Britt may have won out as my favorite of the summer. Britt, like so many of the other Breton beers, seems to be almost a cross between a blanche (wheat beer) and a blonde, but with just a little taste of honey. For the French-speaker among you, learn more about Breton beer from this blog. If you are in Paris and would like to try microbrews from all around France and Belgium, visit the Cave à bulles at 45 rue Quincampoix near Châtelet. For the Wikipedia believers, this may or may not be an exhaustive list of French beers. If you do your own research, be sure to tell me which are your favorites! *Note, according to my online dictionary, “whiskey” is spelled with an “e” generally when referring to Scotch or Canadian whiskey. I’m guessing that Breton whiskey should therefore follow the Scotch orthography.